Brexit slowing 4K TV growth, says analyst | What Hi-Fi? 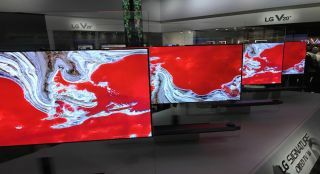 Today's 4K screens make up the majority of TVs sold over £350, but a lack of consumer confidence is holding back sales. TV prices are falling more slowly than expected, and consumer confidence is declining as a result of Brexit. That's according to Nick Simon, account director, consumer electronics, at market analysts GfK. While enthusiasm for buying new sets in the UK remains high, consumer confidence has dipped as a result of the weak value of the pound, says Simon. In fact, confidence among buyers in the UK is now weaker than in any other European country except Italy. Expectations are also high that TVs will soon go up in price. In addition, UK TV prices are not declining as quickly as expected. Year-on-year, they actually increased compared with 2016. Last year, 21.3 per cent of TVs had their prices cut by 40 per cent or more, while this year that figure was only 0.2 per cent. Simon also says that 4K TVs now outsell Full HD screens in the UK by a significant margin. "UHD is now the dominant HD type. That is unequivocal," he said at satellite operator SES's Ultra HD Conference in London (via Digital TV Europe). UHD predominates in sets costing more than £350, and those larger than 44in, he added. According to Simon, the value of 4K sets sold overtook that of Full HD ones back in 2015, although it didn't overtake in terms of volume until some time later. Full HD sets remain popular in the 32in size, where there is no appetite for 4K sets. The 32in sector still accounts for a significant proportion of TVs, according to Simon. 4K Blu-ray players are the only category of Blu-ray or DVD players showing growth, suggesting they could stimulate more sales of 4K TVs. Simon also pointed to shifts in viewing habits among the young that could affect TV sales in future. Only 49 per cent of 18-34-year-olds use the TV as the default device on which to watch content, compared with 88 per cent of the over-55s. However, TV is still the most popular way to watch, with over 65 per cent of total viewing done via a gogglebox.